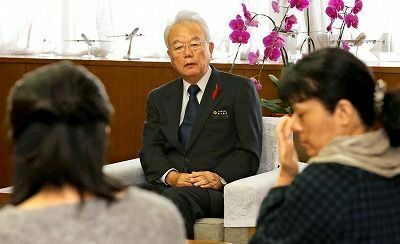 In connection to the fall of a U.S. military helicopter part on the roof of Midorigaoka Nursery School in Nodake, Ginowan, the nursery school parents’ association visited Vice Governor Moritake Tomikawa at the Prefectural Office on the afternoon of December 12 and requested that the prefectural government urge the Japanese and U.S. governments to cease flights until the cause of the accident is uncovered and to stop U.S. military helicopter flights over nursery schools. The parents said that the problem is not whether the particular aircraft part fell in this instance, but that such problems would not occur to begin with if aircraft didn’t pass over the school, and said that they just want their children to be able to live normal lives and be able to play outside without incident. The vice governor read a document with parents’ comments that was attached to the petition and said, “I can clearly see that the children are experiencing great fear and have suffered psychological trauma. A mother living in Aragusuku, Ginowan said she was surprised when her one-year-old daughter, who attends the nursery school, said, “Mama, it’s ‘boom boom!’” when a U.S. military aircraft flew over their house. 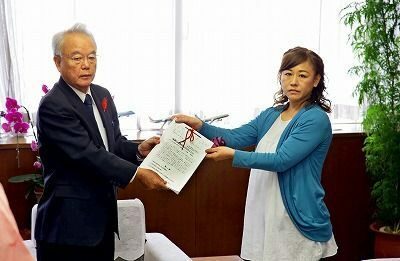 The petition presented to Vice Governor Tomikawa explained that it was a shock to think that the incident remained fresh in the memory of even a one-year-old child who could not yet even speak.